Red Square - its not red and its not square! From outstanding restaurants, pubs and clubs of all description, to world-class hotels and just plain old good-valued accommodation, Moscow Life is here to help you get around and enjoy our fabulous city, with information, news, an introduction to Moscow's culture, as well as comprehensive listings of all the best places to shop, sightsee and generally have fun! Whether you're just thinking about travelling to Moscow or already in the city, we're here to help you make the very best of your stay. 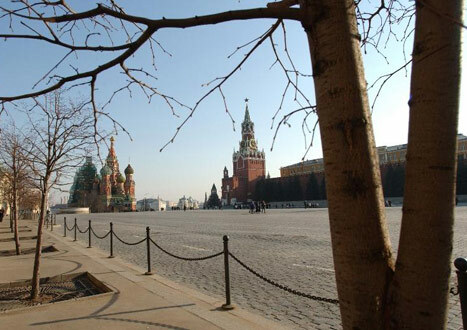 We love Moscow and we are desperate to share all the fantastic aspects of this great metropolis with you, from the bars and nightlife to major tourist attractions like Red Square and the Kremlin and the whole gamut of museums and theatres! We've also got tonnes of practical information to help you, such as advice on getting to and around the city, as well as the latest events, travel tips and an interactive Moscow map. Remember, this website belongs to you too! Not only can you post reviews, and keep everyone up-to-date on the latest hotspots, but we also encourage all your comments and suggestions - so get in touch with us and let us know what you think about Moscow, what you'd like to see on the site, and any other great bits of information you think we should know about. See you soon - and don't forget to check out our other guides to great cities in Russia and the rest of Eastern Europe, such as St. Petersburg, Tallinn, Warsaw and Krakow. Summer's gone again and the brave people of Moscow are preparing themselves for the reality of another long cold winter. But hang on, isn't there the small matter of autumn inbetween? There certainly is, and as the schools and academies welcome back their students, the theatres and concert halls are throwing open their doors too for another cultural season. Plus if you hurry you might catch what is known in Moscow at 'Grandmother's summer'. A few days of sunshine and golden leaves before General winter rolls in with his blizzardry tanks... St. Basil's Cathedral's domes set against a jet black sky, soldiers maintaining vigil on Red Square in blizzardry conditions, babushkas selling their fare in the warmth of subways, mysterious women with high cheek bones dashing from taxi to theatre in fur coats, whilst the common people scramble to get down into the metro or hop onto trams that carve their way through the streets despite the icy conditions. Moscow may have changed a lot in the last five years or so, but some cliches have endured and Moscow in winter remains a remarkable place. In the last twenty years Moscow has transformed itself from a gangster-ridden metropolis on the brink of economic meltdown to the home of the largest number of billionaires on the planet, and one of the most expensive cities in the world to boot. Discover the modern Moscow by mingling with the filthy rich jetset at exclusive restaurants, frenetic nightclubs and high class strip joints. Alternatively savour the city's Communist legacy by delving into the Moscow metro, visiting the Seven Sisters or paying homage to Lenin on Red Square.